My Trusty Sidekick got a job! Woohoo! It’s very, very exciting news–especially since we’re both broke grad students. To celebrate we went out to a delicious seafood meal at the Mermaid Inn on the Upper West Side (there are two other locations in Greenwich Village and the East Village). MI has great fish and a fantastic oyster bar (if you go before 7 pm, there are $1 oysters at the bar–can’t beat that). Their menu is modestly priced–expensive enough to be a really nice “Special Occasion” meal, but not ridiculous (after all, the job doesn’t start until he graduates next Spring). That said, MI also has some great Daily Blue Plate Specials (good until 7 pm) as well as Nightly Specials (good after 7 pm) that make it much more accessible to the student budget. Bottom line–their delicious seafood is worth the splurge! 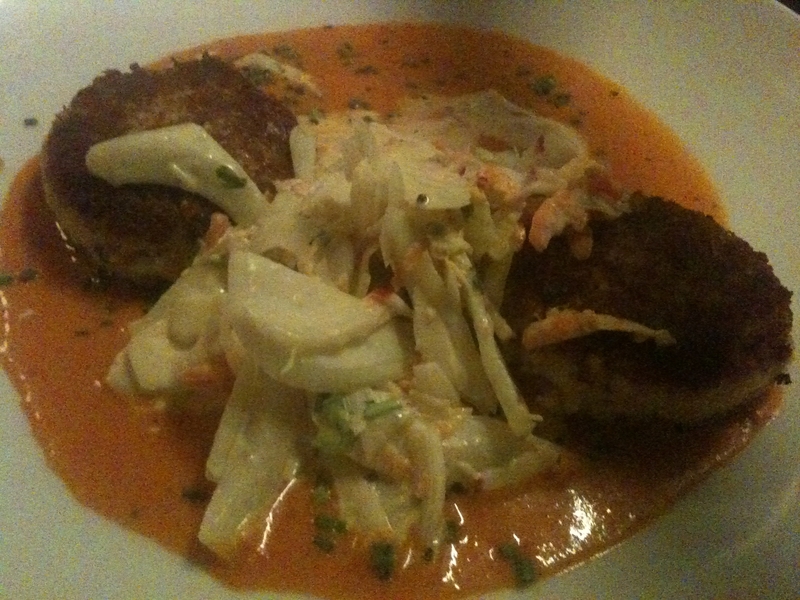 Food: My Trusty Sidekick and I started off the meal by splitting Mermaid Inn’s Friday Night Special: Maryland Crab Cakes with Roasted Red Pepper Sauce and Fennel Slaw ($22). It was amazing. Ah-maz-ing. The perfect appetizer to share. For their Roasted Red Pepper sauce, I think the Mermaid Inn took a page from my brother and sister-in-law’s crab cakes with Red Pepper Remoulade. 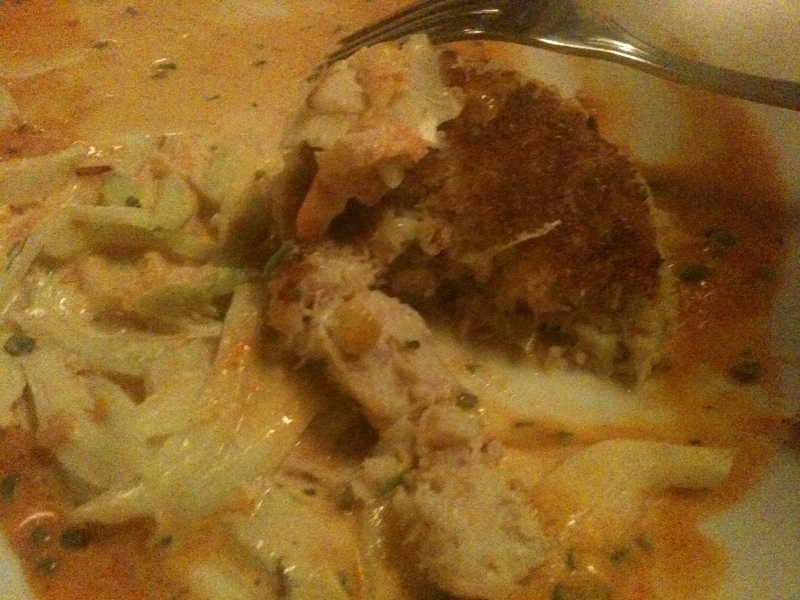 It was a little bit sweet, a little bit acidic, and really complemented the crab cake well. The Fennel Slaw was something I’d never think to pair with crab, but it was delicious. A little bit licorice-y, and very crunchy, it was a light and refreshing contrast to the rich and buttery crab cake, which was delicate and filled with fresh, sweet crab meat. This special is a great reason to check out the Mermaid Inn on a Friday night. 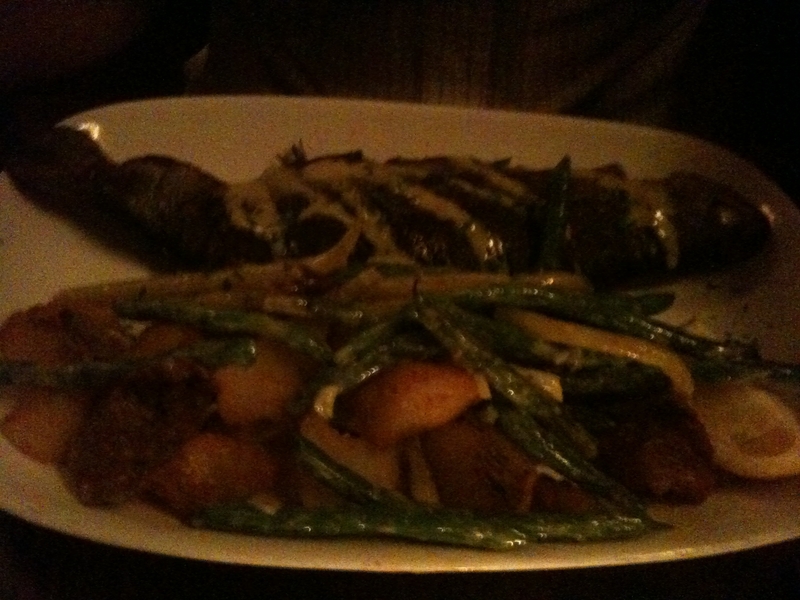 My Trusty Sidekick ordered the whole roasted fish of the night, which was an Idaho Trout, served with an amazing warm potato and string bean salad dressed in the most delicious mustard sauce ($22). I usually avoid eating things with eyeballs, but this was delicious. Here’s how this works–Mermaid Inn roasted the trout and de-boned it before serving it, so, when it arrived at the table my Trusty Sidekick just flipped it open, like a laptop, to reveal one of the most tender, flakey, and flavorful fish I’ve ever tried. I’d love to try to make this at home. 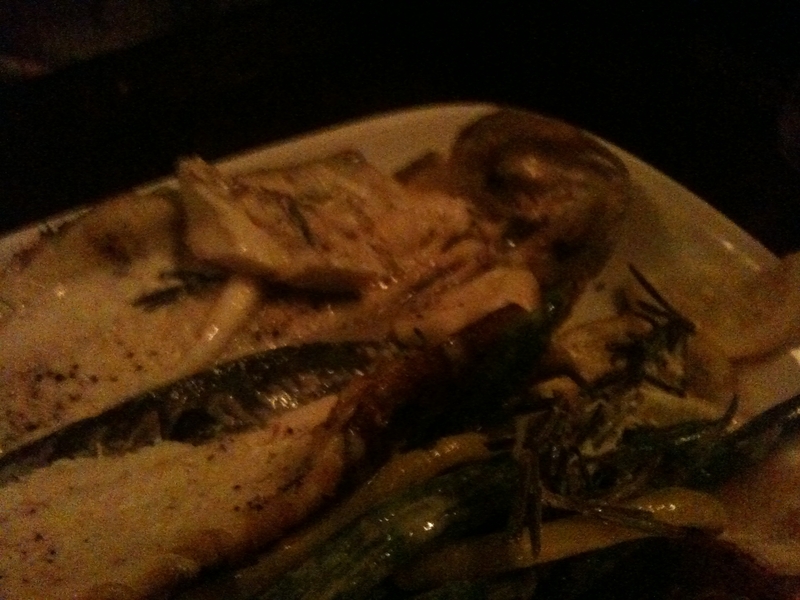 The fish was roasted with a sprig of rosemary, and so when the fish was flipped open, the scent wafted out–yummmm. And, each bite had the very faintest taste of fresh, sweet pine. 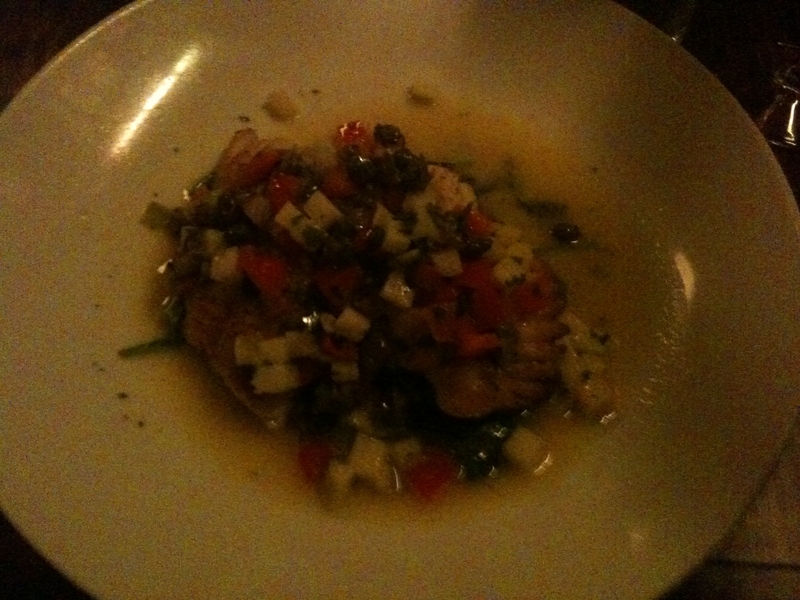 For my main course, I ordered the Skate special ($18), which was pan fried and prepared in a lemon-butter-caper sauce, garnished with green apples and tomatoes, and served with a side of steamed spinach. Skate on a Plate--Yum. Sorry, it's a little hard to see in this picture, but the skate is underneath that pile of diced green apple and tomatoes. 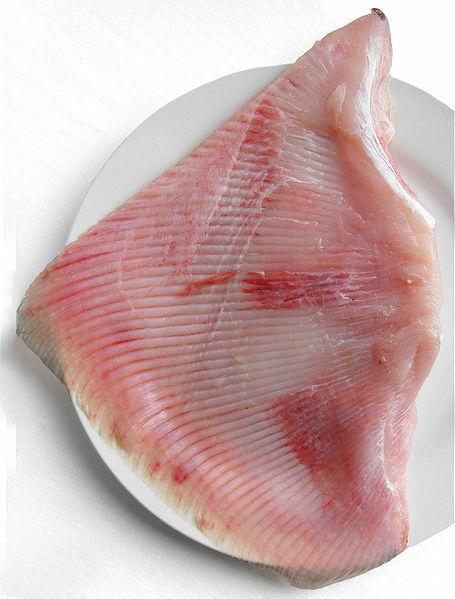 Picture of uncooked skate wing. Photo Credit: Wikipedia. I really liked the combination of the soft skate in the salty and buttery sauce with the crunchy apple, which was slightly sweet, slightly sour. The acid of the lemon and the briney bite of the capers also cut the buttery sauce well. My only complaint was with the spinach. I like spinach as much as the next gal, but, after being steamed, it was so soft and mushy–not my favorite pairing with the already soft and tender fish. I think I would have preferred something crunchy. I actually would have preferred the green beans my Trusty Sidekick got–the mustard sauce on those beans was so so good. Mermaid Inn doesn’t have a dessert menu. That’s the bad news. 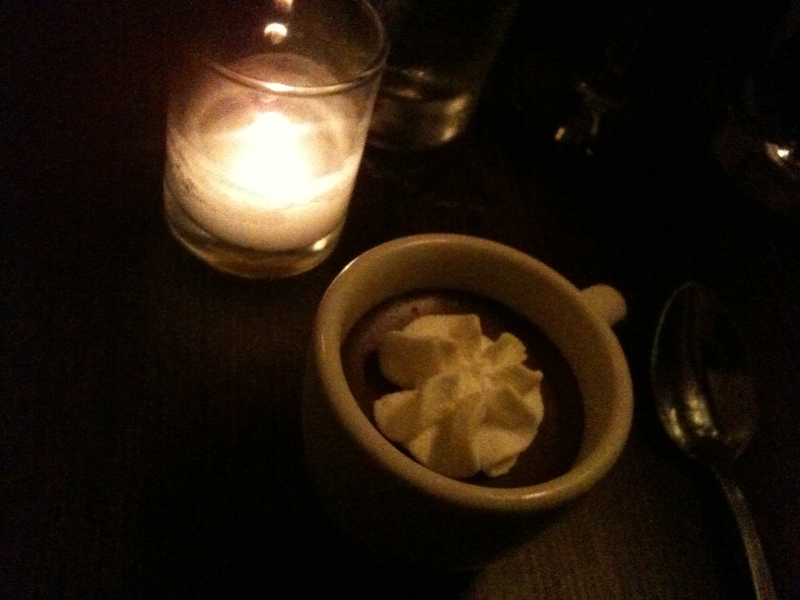 The good news is that they bring everyone a small espresso-sized cup of chocolate mousse at the end of the meal (complements of the chef). Free dessert is one of the other reasons why I love the Mermaid Inn! Yum! Smooth, creamy, cold and chocolatey. The perfect end to a great meal. Plus, it's free! 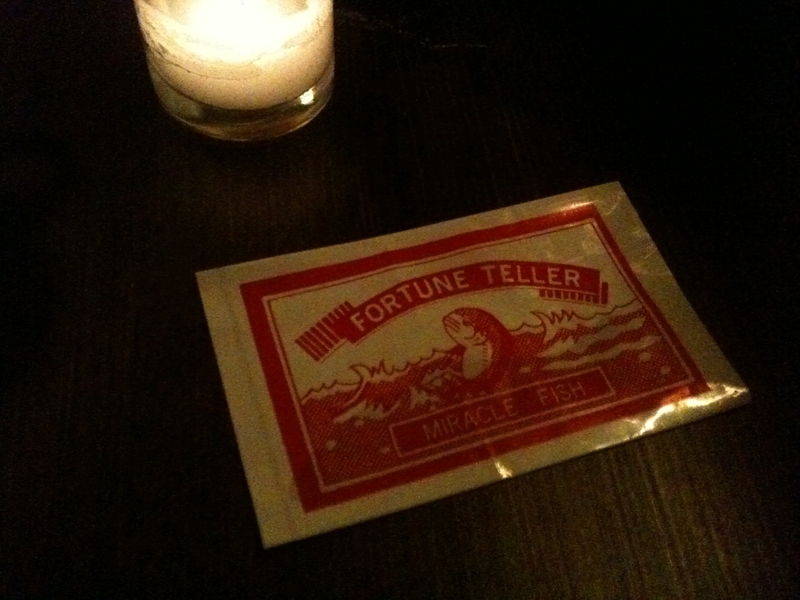 Along with your chocolate cup, at the end of the meal the Mermaid Inn will give you your own Fish Fortune Teller. 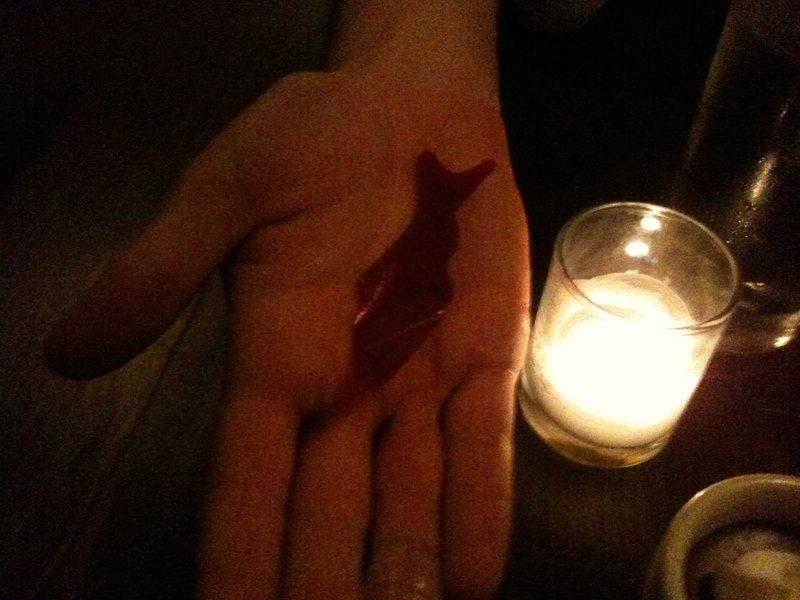 It’s a small fish made out of plastic film that you drop into the palm of your hand. Depending on how the fish moves when it lands, you’ve got yourself a fortune! For example, if the fish curls its head towards its tail, you’re jealous. If it curls its head and tail together, you’re passionately in love (there’s a fine line between passion and jealousy). If the fish doesn’t move at all, you’ve got a dead fish. My Trusty Sidekick got a dead fish. Drink: Mermaid Inn has a pretty straightforward wine and beer menu, with several wines by the glass for $10. 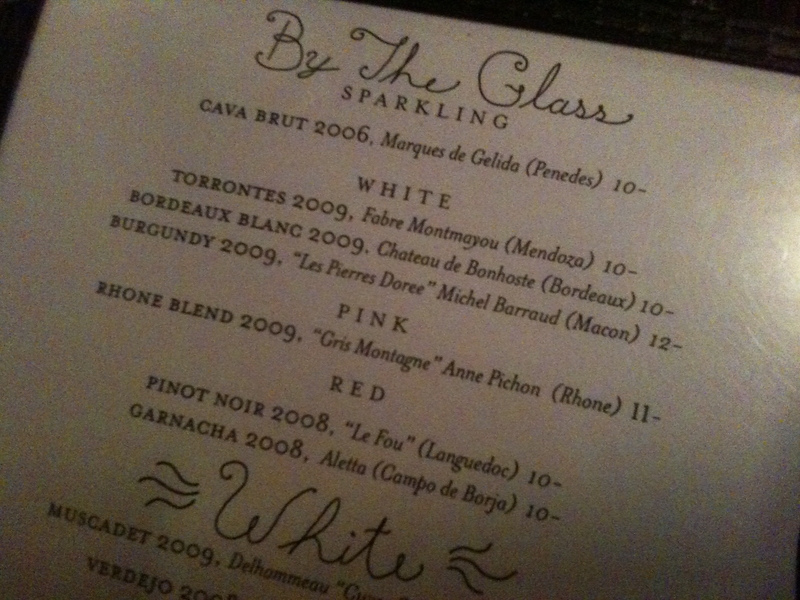 I tried the Cava ($10) and Trusty went with the Bordeaux Blanc ($10). I enjoyed the Cava but have to say that the peach notes in the Bordeaux Blanc made it surprisingly great. Both went very well with our fish dishes. Service: Our waitress and the wait staff were very attentive when we sat down at 7:15. 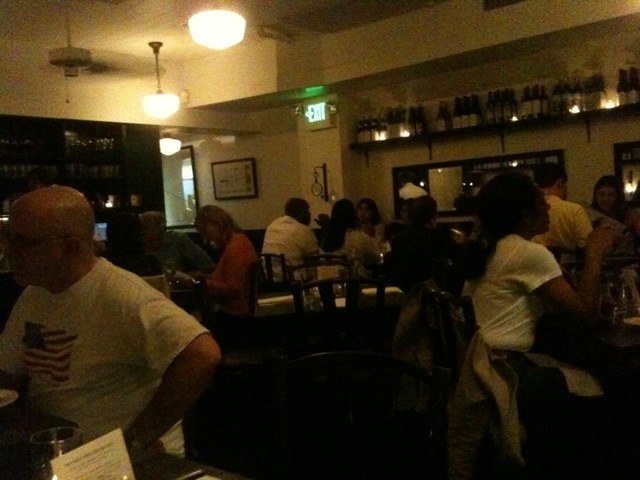 However, as the night went on and the dining room got more crowded they forgot about us. Our water glasses weren’t refilled more than once, and we waited about 15 minutes after finishing before we were finally were able to flag down our waitress and ask for the check. Slightly irritating, yes, but nothing that will keep us from going back. Scene: There was a big variety of guests in the dining room–families with young children, couples, tables of girlfriends. The restaurant has a very laid-back feel. The wood paneling, maps of different coasts and pictures of fish hanging on the wall make it seem like you’re walking into a Cape Cod or New England restaurant–it feels very authentic, not in a kitschy way at all. Dress: Friday business casual is safest. It’s a nice meal, so you’ll probably want to dress up a little. But, if you don’t, jeans and a nicer top will work. That guy in the American flag t-shirt (in the left hand corner of the picture above) was a bit under-dressed. Cost: With tax and tip our great seafood dinner was $110. Definitely in the “Special Occasion Price Range” for us.